Welcome to Curtain Design Ltd of Leek. All types of made to measure blinds. Curtains, Valances, Pelmets, Roman Blinds, Tiebacks & Cushions made to measure. All makes of made to measure Blinds - Conservatory Blinds, Venetian, Roller, Vertical & Pleated by Sanderson, Faber, Illumin8, Charles Bell, Velux and others. Curtain Poles & Tracks supplied to order. Curtain Design Ltd of Leek, specialists in creating and supplying Curtains, Valances, Pelmets, Roman Blinds, Tiebacks, made to measure Cushions and all makes of made to measure Conservatory Blinds throughout Staffordshire, Shropshire, Cheshire and Derbyshire. Learn more..
"Using the latest fabrics & wallpapers, transform your living space with vibrant and exciting designs." 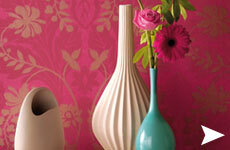 Using the latest fabrics & wallpapers, transform your living space with vibrant and exciting designs. To make your wishes come true contact us at Curtain Design Ltd of Leek and let us make it happen for you. 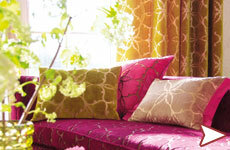 Curtain Design Ltd of Leek, For all your made to measure soft furnishings at affordable prices. learn more..
All the latest Fabrics & Wallpapers by Montgomery, Crowson, Sanderson, John Wilman, Romo, Villa-Nova, Prestigious, Chess and many others. 1000’s of designs to choose from. learn more..